The cast of Signature Theatre’s production of Crossing. Photo credit: Teresa Wood. 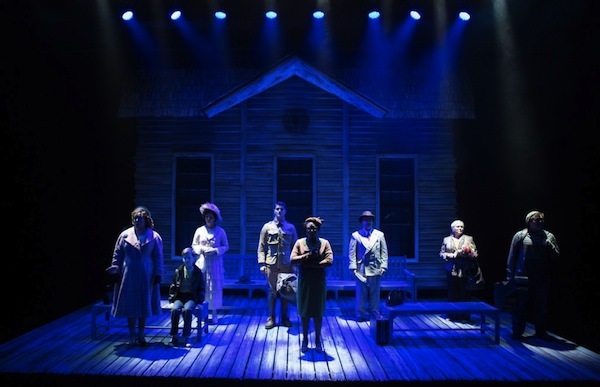 There was so much to like about Crossing at Signature Theatre, the world premiere musical written by the extremely talented writing team, Grace Barnes and Matt Connor, whose Nevermore was premiered at the theatre in 2006. From Eric Schaeffer’s beautiful, yet simple set design, the spectacular rain effects orchestrated by lighting designer Chris Lee, the lovely underscoring of the orchestra led by music director Gabriel Mangiante, to the phenomenal acting and vocal prowess of nine incredible actors, Barnes and Connor created moments of theatrical magic, punctuated by uncomplicated dialogue and enchanting melodies. There was also much about Crossing that was problematic. Although it has enjoyed readings and a workshop, this is the first full production of Crossing and, like all new shows, it felt like it was still trying to find its footing. The challenge of producing new work is that the premiere production is part of the continued refining and improving of a show, which means that the initial audience is witness to some of the kinks and challenges that eventually are worked out until a show is a masterpiece. Understanding this, I applaud the writing of Barnes and Connor, who have a very solid framework in place, and am confident that Crossing will achieve the same success that their Nevermore and Connor’s The Hollow and Night of the Living Dead are enjoying. Set in a train station in anytown and anytime USA, Crossing follows the personal intimate emotional journeys of travelers as they wait for a train, highlighting the concerns and fears that they can’t share with loved ones, but choose to share with strangers to whom they feel a kinship, in the same way many people do with others they are seated next to on an airplane or a neighboring bar stool. Although the characters are living in different decades of the twentieth and twenty-first centuries, they interact with one another beyond time and comprehension, listening to, supporting, and uniting with one another, giving the audience the impression that regardless when or where we live or have lived, each human soul has a journey they have to make alone, but are afraid to do so. The nine actors who play each of these characters were extremely talented and impressive. Signature regulars Christopher Mueller, Chris Sizemore, Florence Lacey, Nova Y. Payton, and Tracy Lynn Olivera, were all well-cast and although they have been seen in numerous shows on the Signature stage, their commitment and transformation to their respective roles made you forget you have seen them in anything else there. Joining them were Peggy Yates, Austin Colby, Ines Nassara, and John Ray who were equally committed and enjoyable to watch. The cast had a lovely symbiosis and it was a clear this was an ensemble of actors who support one another wholeheartedly. Likewise, the production elements were alluring. Crossing is beautiful in its simplicity. Connor’s music is effortless and sweet, there is one act, one set, one set of costumes, a small handful of sound cues, no choreography, and not many places for the actors to move onstage since all nine are onstage the entire show, working their way in and out of train platform benches. The intimacy produced by these uncomplicated elements was touching and at times, breathtaking. When Payton as the Unknown Woman, was singing “After the Rain,” lighting designer Lee used a pool of light, a purple wash, and smoke to create a rain effect that was brilliant and dazzling. The quality of the designs and the performances, however, weren’t enough to leave me feeling satisfied when the production was over. When the house lights came up, I found I had more questions than answers and, like a diner who has enjoyed a great appetizer in anticipation of an even more promising entrée only to be told the meal is, in fact, over, I found myself wanting more as the cast were taking their bows. The audience is introduced to the nine characters and provided with just enough information about their lives and struggles that they become sympathetic and you root for them to find the answers, the peace, or success they are searching for. But that’s it. The audience is not fed any further. Whether these characters will actually find resolution is unclear. Will the 1917 Soldier return home alive from the war? Will the 1964 Civil Rights Marcher actually have the strength to board the Freedom Train, knowing the struggle ahead? Will the daughter of the 1977 Woman with Flowers actually arrive and if she does, why exactly is she coming home? Will the Wealthy Man in 1929 really jump in front of the train and end his life? Will the Woman in Pink in 1954 ever get on the train? And what will become of her son who longs to travel anywhere? Will the backpacker of today decide to return to the USA or will he find he enjoys the expat life and the promise of romance overseas? And who, exactly, is this Unknown Woman and what is her purpose in the show? Nothing is told of her story, who she is, why she is there, and aside from the fact that Payton has a heavenly voice and is a pleasure to watch, I had no idea why she was there. She almost seems to be some sort of ethereal presence, but exactly what or who she represents was so ambiguous, I wasn’t really sure. I was invested in these characters (with the exception of the Unknown Woman) and to have the show end without satisfying my craving to see their journey come to any sort of conclusion was frustrating. The train arrives, but then what? Although I appreciate a show that allows the audience to form their own conclusions and ideas, this felt more like a cliffhanger that ultimately left me dangling. Crossing performs at Signature Theatre now through November 24, located at 4200 Campbell Avenue, Arlington, VA 22206. Tickets $29-79. For more information call 703-820-9771.